“I think God calls me Patrick, and that’s good enough,” Canon Patrick Comerford recalls telling a little girl who asked him what she should call him, a familiar problem for someone with as many letters before and after his name as he has. 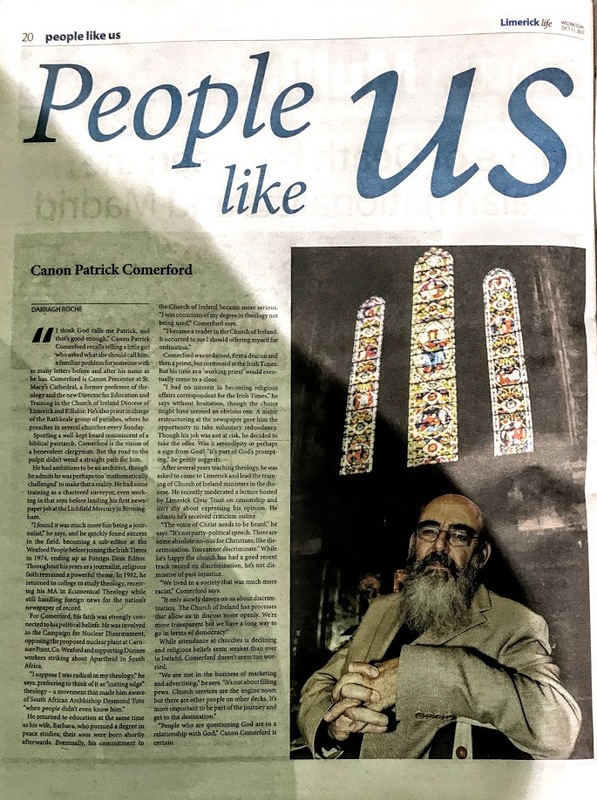 Comerford is Canon Precentor at St. Mary’s Cathedral, a former professor of theology and the new Director for Education and Training in the Church of Ireland Diocese of Limerick and Killaloe. He’s also priest in charge of the Rathkeale group of parishes, where he preaches in several churches every Sunday. Sporting a well-kept beard reminiscent of a biblical patriarch, Comerford is the vision of a benevolent clergyman. But the road to the pulpit didn’t wend a straight path for him. He had ambitions to be an architect, though he admits he was too ‘mathematically challenged’ to make that a reality. He had some training as a chartered surveyor, even working in that area before landing his first newspaper job at the Lichfield Mercury [near] Birmingham. “I found it was much more fun being a journalist,” he says, and he quickly found success in the field, becoming a sub-editor at the Wexford People before joining the Irish Times in 1974, ending up as Foreign Desk Editor. me his years as a journalist, religious faith remained a powerful theme. In 1982, he returned to college to study theology, receiving, receiving his MA in Ecumenical Theology while still handling foreign news for the nation’s newspaper of record. For Comerford, his faith was strongly connected to his political beliefs. He was involved in the Campaign for Nuclear Disarmament, opposing the proposed nuclear plant at Carnsore Point, Co. Wexford and supporting Dunnes workers striking about Apartheid in South Africa. He returned to education at the same time as his wife, Barbara, who pursued a degree in peace studies; their sons were born shortly afterwards. Eventually, his commitment to the Church of Ireland became more serious. “I was conscious of my degree in theology not being used,” Comerford says. Comerford was ordained, first a deacon and then a priest, but continued at the Irish Times. But his time as a “work[er] priest” would eventually come to a close. “I had no interest in becoming religious affairs correspondent for the Irish Times,” he says without hesitation, though the choice might have seemed an obvious one. A major restructuring at the newspaper gave him the opportunity to take voluntary redundancy. Though his job was not at risk, he decided to take the offer. Was it serendipity or a sign from God? “It’s part of God’s prompting,” he gently suggests. 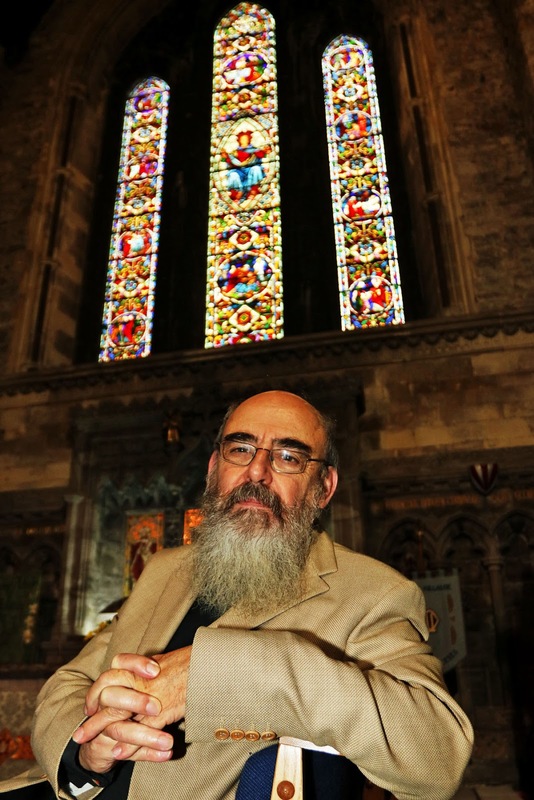 After several years teaching theology, he was asked to come to Limerick and lead the training of Church of Ireland ministers in the diocese. He recently moderated a lecture hosted by Limerick Civic Trust on censorship and isn’t shy about expressing his opinion. He admits he’s received criticism online. “The voice of Christ needs to be heard,” he says. “It’s not party-political speech. There are some absolute no-nos for Christians, like discrimination. You cannot discriminate.” While he’s happy the church has a good track record on discrimination, he’s not dismissive of past injustice. “We lived in a society that was much more racist,” Comerford says. While attendance at churches is declining and religious beliefs seem weaker than ever in Ireland, Comerford doesn’t seem too worried. “People who are questioning God are in a relationship with God,” Canon Comerford is certain.